The French bashers who would chalk off this loss of 150,000 troops to the stupidity or recalcitrance of the French should consider that America got a third of the way there in Vietnam when they got entrenched in a guerrilla war because of an illegitimate regime change operation. Before anyone dismisses this historical event as being completely irrelevant today, they should first ask if any of the relations among states of affairs within the analogy present any insights we should think about. Of course there are dissimilarities; no analogy presents an identical relationship. The question of whether things are going well in the current American regime change operations is a viable one. Those in charge today tell us that “freedom is on the march.” Women are now voting in Afghanistan. We’re supposed to be reassured that three fourths of the Al Qaeda leadership has been captured or killed. Our Commander-in-Chief asks, “"Who could possibly think that the world would be better off with Saddam Hussein still in power?" Well, an answer could be those who are capable of a complex moral evaluation that rises above the adolescent rhetoric of good and evil. It could include anyone who values means as well as ends, or anyone who recognizes the gravity of principle, the rule of law, or processes within constitutional republics. It may even include the most Machiavellian consequentialists, as long as they are capable of calculating the consequences of more than one consequence at a time. But the establishment has been in utter denial regarding even the potential of a substantial insurgency taking root; the attacks are conducted either by a few remnant loyalists or by outsiders—they just can’t be part of an Iraqi guerrilla movement. Just weeks ago on the anniversary of “a day that shall live in infamy,” the infamous Oliver North reassured a veteran audience that things were better at this point in time in this war than they were at a comparable time during WWII. North dismissed the possibility of a legitimate Iraqi insurgency as he listed a dozen other countries that were providing all the insurgents. Many officials will continue to think there are dozens or hundreds or maybe a few thousands of Iraqi insurgents when there are more likely hundreds of thousands of them. These same officials will not want to admit that there are more terrorists today, sticking straight to their story that there are maybe dozens or hundreds of Al Qaeda members when they more likely number in the tens of thousands. No matter how the recalcitrants manipulate the utilitarian calculus, it’s hard to avoid the conclusion that the world is in many significant ways a more dangerous place because of the regime change operations. Many interesting questions arise when considering regime change operations. Is the phenomenon a new one? 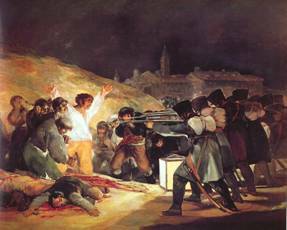 If it is not new, what can we learn from its use in history? Is it practical or is it counterproductive? Is it justifiable or not, right or wrong, good or bad? Is the rule of force that a regime change operation entails necessarily a departure from the rule of law? By the end of this essay some preliminary sketches will emerge that begin to answer these questions. However, the main questions I will focus on have to with planning for regime change operations. We think of assigning moral praise and blame once agents have acted, but we have not paid much attention to the role that moral thinking should play during the planning of regime change operations, or of any operation, for that matter. If we have the made the world worse off through the doctrine of regime change, then we should evaluate the process of regime change. When does a regime change operation begin? Does it start when the troops cross the line of departure? Or does it start very early on, when American leaders identify a state as a security threat, when a rogue state has crossed the line, aligning itself on an axis of evil? Or does it begin somewhere in between? When it was time for the military to start planning the regime change in Afghanistan, their job was to figure out the plan and then to execute it. And when it was time to start planning the regime change in Iraq, they did their job there, too. And should they be told by their civilian bosses to start planning for the next regime change, they will follow suit. Regime change begins as a political crusade. The political leaders decide that the political renewal of a nation can only be achieved by the military. And we have the birth of a nation, or the rebirth of a nation. As moral agents, all political and military leaders share moral responsibility for regime change operations, throughout the operation and beyond, but particularly during the planning phase. Current operational design systems that generate operational plans neither facilitate moral agency nor distribute moral responsibility fittingly. The normal distinction between jus ad bellum and jus in bello may no longer be adequate when considering regime change operations. There have been recent attempts to add jus post bellum to complete the division of labor so that the Just War Tradition can do its job fully. This triad divides the justice of conflict up temporally: before, during, and after war. However, it does not cleanly divide up the moral agency and responsibility among people, institutions, agencies, or states involved in those conflicts. Moral agency and the moral responsibility of these different entities cut across the triad. There is a general trend in the Just War Tradition to assign political leaders the responsibility of jus ad bellum and military leaders the responsibility of jus in bello. Yet, even Walzer’s explication of this distinction in his framework admits of an exception that may be large enough to threaten the rule. Specifically, in Just and Unjust Wars, he sets about showing the logical and practical distinctness of jus ad bellum and jus in bello with separate parts in his book. He then adds another entire part to his book explaining that the two species of justice merge and overlap in many significant ways. So, after he enumerates the constitutive and individuating principles that separate the two domains into different species, he has to admit that the differentia are threatened by numerous transcategorical and metacategorical principles, making the two realms far less separate than the original framework suggests. How do they merge? Is there any question that military leaders can influence jus ad bellum catastrophes? We need only be reminded of the convicted felon Oliver North and his role as a military officer in the counter-insurgency during the “first war against terrorism” under the Reagan administration as they attempted illegal and misguided regime change operations in Central America. Alternatively, it’s been said that the road to Abu Ghraib has been paved by memos from the White House. In the first case, a marine lieutenant colonel was directly influencing jus ad bellum transgressions, and, in the second political leaders were directly influencing jus in bello violations. The White House is not the only nexus where traditional roles and responsibilities become blurred between political and military leaders. There are many cases in which moral responsibility crosses this line. The culpability, complicity, and responsibility of military and political leaders in such cases that go morally awry should remain the subject of serious debate and investigation. Oliver North now enjoys celebrity status despite his role while no political leaders were found culpable for the Iran-Contra scandal. Under the penumbra of Abu Ghraib today, only low-level troops will be held responsible for the system of detention and mistreatment while Rumsfeld gets another term of office and Gonzales becomes the attorney general. The system perpetuates the distinction protecting military leaders from responsibility for crimes at the political level as well as political leaders from responsibility for crimes at the military level. The system continues to thwart the assignment of responsibility, thereby threatening the whole notion of moral agency. Should we accept this distinction as Paul Christopher lays it out? He argues that political leaders do and should remain responsible for jus ad bellum issues and military leaders for jus in bello issues, that officers should not cross this line and influence jus ad bellum issues, and that military officers should consider the jus ad bellum issues resolved and the conflict formally just by the time the mission is handed over to them. In other words, the military leaders have no role in jus ad bellum questions. The Just War Tradition along with its temporal division of jus ad bellum and jus in bello perpetuates this problem, because the former concerns itself with those matters occurring before the war (and hence remain political issues alone) and the latter with matters once the conflict begins (and hence remain military issues alone). Perhaps it is time to question this distinction more strongly. The current framework of an operation may be part of the problem. There is a temporal continuum for a regime change operation—before, during, and after—broken into phases. But, perhaps even more important for this inquiry, there is also a hierarchical continuum, spanning the different levels of conflict: from the highest strategic level to the lowest tactical level and including the operational level in between that links the other two. I say that the latter is perhaps more important because the leaders throughout the institutions involved are moral agents and as such have moral agency. We can investigate the moral agency and responsibility of these moral agents by looking at the framework of these political and military levels of conflict—and levels of responsibility. An acetate graphic dividing the political realm from the military was permanently fixed to the moral map dividing the realm of jus ad bellum and jus in bello in the modern Trinitarian Age. The military trinitarian world emerged from the Newtonian universe, a universe of cause and effect, with order, where human, social, and political categories were carved neatly at the joints. Clausewitz echoed the Kantian and notion that war is an activity of the state, that war is connected to the state, that military affairs are the province of the state, or in Clausewitz’s terms that war is a continuation of state policy by other means. Most people believe that this truism is so obvious it barely needs repeating. The notion that military affairs are an extension of political affairs happens to be only possible arrangement. Another possibility is that the two are completely separate, as was the case in Sun Tzu’s world. And yet another possibility is that they are the same thing, as they happened to be in Mao’s world. The Newtonian hierarchy that cleanly separates the political from military affairs may no longer be explanatory or operative or constructive. In the Newtonian, trinitarian universe, political leaders have (ostensibly) the moral agency and moral responsibility for jus ad bellum issues and military leaders have (ostensibly) the moral agency and moral responsibility for jus in bello issues. The political and military domains overlap so significantly today that it no longer makes sense to view their overlapping as anomalous, but following Kuhn the interdependency between the two should signal the need for a new paradigm. Political and military leaders influence ethical matters in both the political and military realms. Therefore, political and military leaders share moral agency in both the political and military realms at all stages of a regime change operation. Following this state of affairs, it may be time to address the issue of also assigning them moral responsibility. Military leaders can and do influence the political process in going to war and political leaders can and do influence the military affairs once the conflict begins. After a conflict begins, military leaders can continue to influence the political realm, and they often are a large part of the political realm during Phase IV of an operation—known as the post-conflict phase. This fact is especially clear when one admits that Phase IV begins as soon as the troops cross the line of departure. Military responsibility in military affairs is especially relevant while developing operational plans. American military planners through their training and education should know that their planning should be at a minimum morally bound by the legal framework of the laws of war. Many planning staffs and cells have JAG officers in them to help stay within legal boundaries. Legal expertise notwithstanding, military operations pose many problems for keeping conflicts both legal and moral. Rules of Engagement are at times used instead of the laws themselves. JAG officers will interpret laws and ROE differently. Commanders are not bound to follow the advice of these lawyers. And we all know that the legal does not equate to the moral. 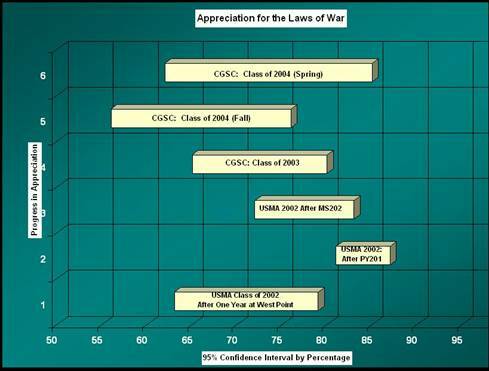 As Paul Christopher notes, “the relevant military manual advises soldiers to obey only lawful orders, while at the same time acknowledging that they often will be unable to tell lawful orders from unlawful ones!” My own informal survey of awareness of the laws of war for both cadets at West Point and majors at CGSC show that there is at best only a moderate commitment to the laws of war and the moral principles that support those laws. The following chart shows a comparison of the level of awareness of these laws. Controversially, I am arguing that military responsibility in political affairs is also relevant during the planning phase of a regime change operation. If it is true that both political and military leaders can and should influence and exercise agency during all phases of an operation, then we should more fully understand and come to grips with what the military’s role should be in the political realm. The American military has a long history with regime change operations. If these operations appear to be a new way of doing business, it is only because they are now overtly proclaimed in our national security and military strategies where they used to be covert. Prior to WWI, American leaders thought their greatest threat was Mexico. The military drew up plans to defend against Mexico by attacking Mexico and installing a new regime. Perhaps Vince Lombardi got some of his ideas by studying American history. The history of the South America and the Caribbean during the first half of the last century is one long saga of regime change operations. Since the end of WWII, there have been at least thirty regime change operations, which have ranged from propaganda campaigns and ballot tamperings to assassinations to covert coups to full-blown military operations. There is only one American president in the last century who did not attempt a regime change operation, President Carter. The number of regime change operations would be hard to count, and the number of plans for these operations as well as the much larger number of plans for contingency operations would be all the more difficult to grasp. How many of these plans spent any time on moral considerations? How many of these were blatantly illegal? Did the planners for the Bay of Pigs Operation spend any time considering the restraints of international law? And how about the planners for Operation Northwoods? When the military plan for the regime change in Afghanistan called for the use of proxy forces, did the planners consider how this plan ran counter to the political goal? Specifically, if the political goal is to eliminate rule by warlords, then how does the military plan support that goal when it simply empowers other warlords? Today Afghanistan remains more aptly named Warlordistan. What is the ontological status of a plan? In other words, when does it become real? While it sits on a shelf, does its reality exist in its potential, or does it become real only when it gets implemented? Don’t plans imply intent? And isn’t intent part of the moral evaluation? What happens if we don’t consider this new direction? Well, more and more and more of the same. The military is shouldering more of the moral burden of regime change operations than it deserves. It is taking on more of the moral responsibility without the commensurate moral agency. We are in this unfortunate situation right now because political leaders are not taking responsibility for the moral agency they are exercising. So, since agency crosses the traditional line between political and military leaders, then so should responsibility. Moral agency and moral responsibility should correspond. It is the planning system itself that needs improvement. The military leaders are doing the best they can with the system they are given. But the military should spend some time rethinking and retooling their planning systems so that America can better ensure that her military operations match the high moral standards in her rhetoric. I am not now proposing how this can be done at this point. I am only arguing that there is a case that it should be done, that we study this to understand it better and then genuinely consider possibilities that approach how it can be done. Today the military plans for and executes the operation, removing a regime so a nation can be born, or for those fundamentalist minds now in charge who think in biblical terms, perhaps reborn. These recent births have been so violent that both mother and father have been killed in the process. We all hope that whatever nations are born by these regime changes can survive their births and continue to live on their own, that they not become still-born. We still do not know for sure if these births will succeed in some fashion. We do know that they have not succeeded according to the plan, which means that there was something wrong with the plan. All I am suggesting is that there is room for improvement. So, if you see a car with two “Support our Troops” ribbons along with a bumper sticker that says, “Stop Abortions Now,” as I saw the other day driving onto Fort Leavenworth, you should stop wondering—the driver is not conscious of the potential irony. Factual details drawn from Tom Huber, “Napoleon in Spain and Naples,” Fort Leavenworth, Kansas, Combat Studies Institute, US Army Command and General Staff College, 2000, 172-181. Paul Christopher, The Ethics of War and Peace, 3rd Edition, Pearson, Prentice Hall, 2004, p. 127.